The symbol on the wheel for this House is an Egyptian barque under sail; the Egyptians held that the sun traveled in such a ship over the heavens and through the underworld each day. I love my motorcyces. I ride to work every day, rain or shine. My main current ride is an '89 Yamaha XV1100 Virago. I also own a '74 Honda CB360 (my very first bike; here is a picture of me on it, taken at the Emeryville Marina near Sybase), and one of my dream bikes, a '73 Triumph Bonneville that looks a bit like this one. However, my Bonnie has a non-stock exhaust and racing cams; it used to belong to a woman who raced it. I've got quite a few motorcycle links. 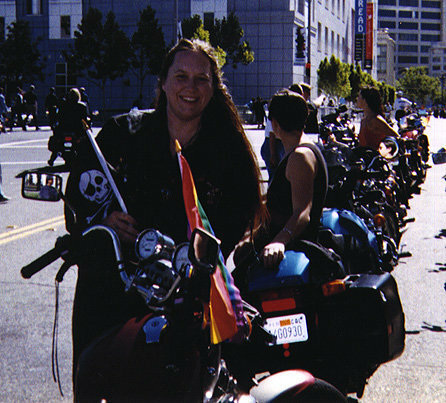 I had the very great pleasure this year to ride for the first time with the Women's Motorcycle Contingent in the San Francisco Gay Lesbian Bisexual Transgender Pride Parade. I've put up a page of pix and descriptions all its own. I still haven't sent in my documentation for the IronButt ride, because I'm not sure, in my heart of hearts, that we actually made 1000 miles, even though all three of our odometers read over 1000, and I hate rejection. Especially after the trip we had. It was definitely a quest, with all attendent triumphs and tribulations. One of these days I'll finish the Beowulf-style epic poem I began about it, and post it here.